With the nights now looming long, it’s that time of season when we begin looking forward to the next year and thinking about what we need to change to stay competitive. There’s not much more we can learn about 2016, but there’s a lot we can learn from 2016. This article examines the ways content marketing and content marketing SEO will continue to evolve in the next 12 months. Taking more time to produce longer content is the big trend in content marketing. Marketers are spending a lot more time on each post and writing a lot longer than they did in the past. 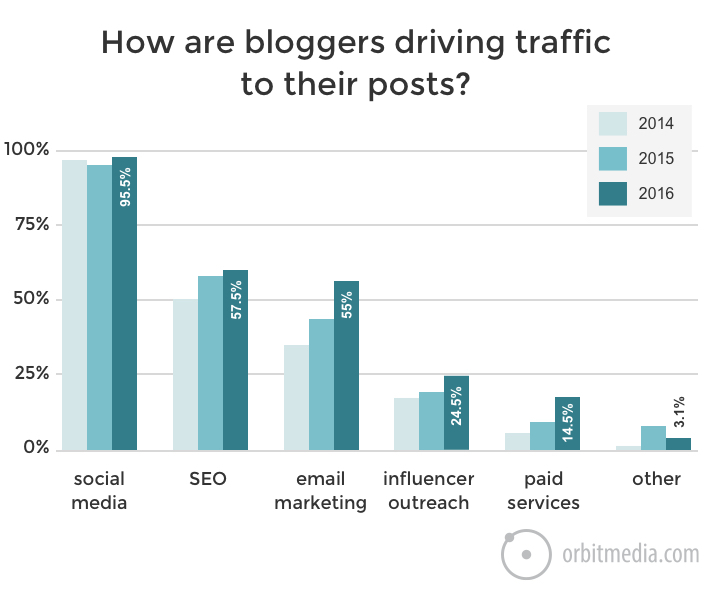 My company Orbit Media Studios just finished our third annual survey of 1,000 bloggers and the trend is clear. In 2016, the average blog post took 3 hours 16 minutes to write. That’s a 26% increase from last year. 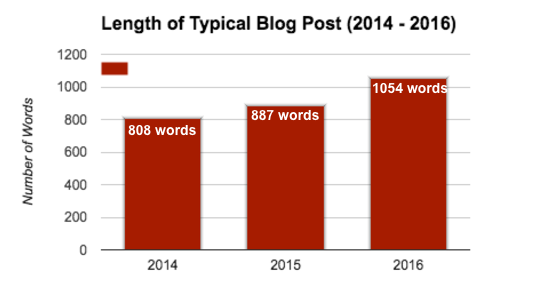 The average blog post is 1,050 words long, up 19% from last year. It’s a quest for quality and more bloggers are going big. 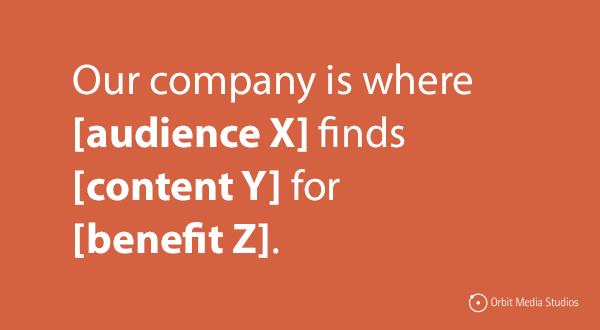 This is probably the biggest trend in content marketing. I don’t see anything reducing the importance of influencer marketing, unless celebrities somehow become less famous. Hard to imagine that happening. But there are influencer marketing tactics that may decline. For example, readers may get tired of mega-roundups, CTRs for those posts may decline and results would drop. This could make those giant roundups less effective and less popular. There are people in every industry who have become influential over large groups of people. In the future, they will likely become even more influential. There are brands that want very badly to connect with those people. In the future, this will also continue. The tools and tactics that connect those brands to those people have become more efficient and effective. This will also continue. So look for more mini-celebrity endorsements and more collaborative content. Influencer marketing rewards those that are good at networking and personal branding. The future belongs to friendly, generous people! RankBrain is the name of Google’s machine-learning artificial intelligence system. It helps sort through Google’s search results and is an important new part of how Google is improving their rankings. 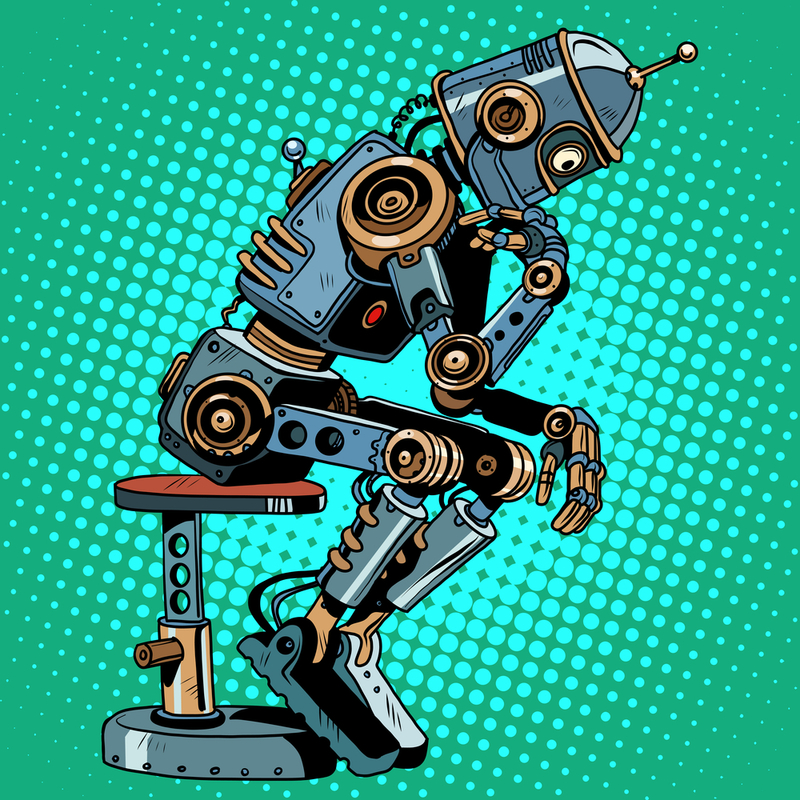 Before: Google engineers (humans) created hypothesis about possible improvements to its algorithm, then they made changes within test environments. Next those test search results were shown to small armies of quality raters (humans) who then scored the search results against criteria provided by Google. If the tests looked good, Google would make the change. Now: Google is built to use machine learning (artificial intelligence) to create and run its own tests to see how they perform with a group of searchers. If the searchers click on a search result without immediately searching again, that’s a good sign. If they click on a search result and stay on that page rather than immediately hitting the back button, that’s a good sign. So now more than ever, search optimization is about quality. It’s about the visitor. It’s about making great pages. But what’s a great page? It’s a page that people land on and love. Start with a visual. A strong featured image helps get the visitor engaged. Add a video. Videos are the strongest visuals. Adding videos high on pages is a good way to keep visitors. Short paragraphs. No one wants to read a long paragraph on the Internet. Subheads and bolding. These are types of formatting that keep scanners moving. Internal links. This encourages visitors to click forward, not back. 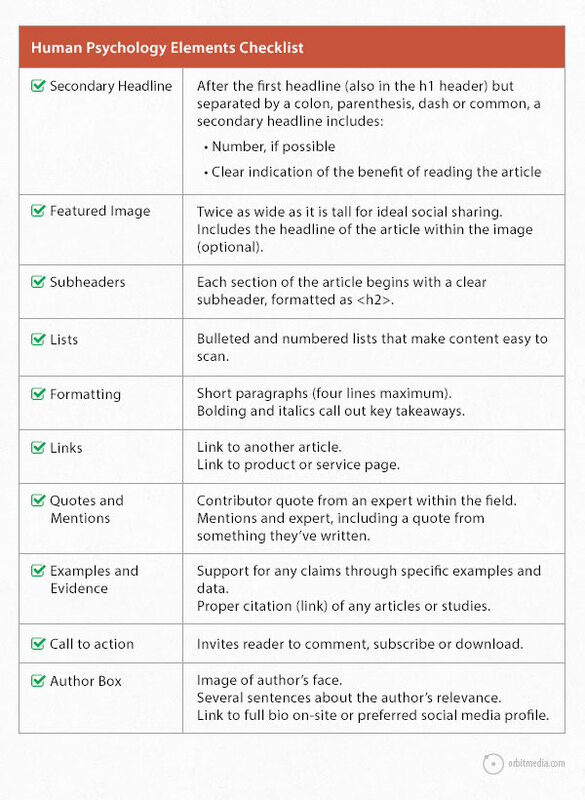 Here’s the “human factors” section of Orbit’s content checklist. Add as many of these as you can! As always, if we’re doing SEO, our goal is the make the best page on the Internet for our topic. It’s good for visitors and it’s good for RankBrain. Google’s new AI system has great ways to find quality. Your job is to create that quality. There’s one, all important thing about content. It must answer the “what’s in it for me” question. It has to be focused on the reader. That’s it! We all agreed that this was exactly right. Then we looked at the blog and noticed the “Company News & Announcement” section. It obviously didn’t fit, so we killed it instantly. Then we took out the domestic travel section. Suddenly, and forever after, they have a better blog. 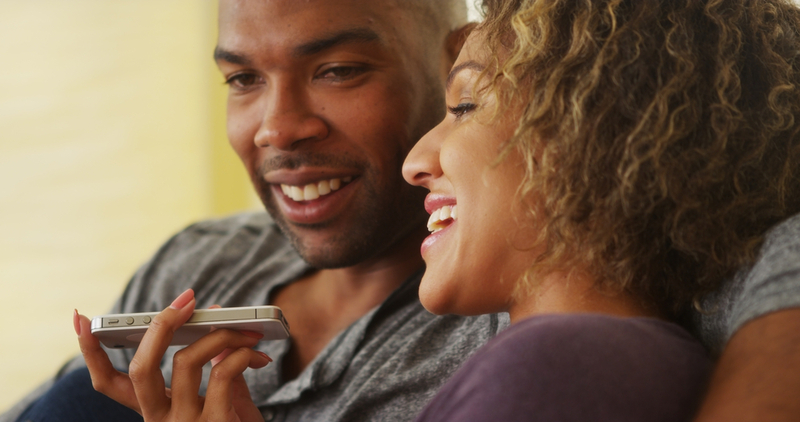 How Will Voice Search Impact Content Marketing? OK, so we’ll be talking to Alexa, Siri, and Google, and they’ll be talking back to us. We ask, they answer. Not a pixel in sight. But that doesn’t mean that we can’t adapt to natural language search. Here’s what you can do to get your content ready. Write complete, full-sentence questions in your articles, rather than breaking it up between several sentences. Write complete, full-sentence answers in your articles. The typical 500-word blog post takes 2 to 2.5 hours to write. Use long, specific phrases in your titles and headers. Combine these and you’ll increase the chance of your content marketing appearing in the knowledge box at the top of search results. I can’t say for sure if this affects your clickthrough rate (Google is giving visitors the answer right there in the search results page) but it is fun to see yourself at the top. Dr. Pete from MOZ called this “ranking number zero.” If nothing else, it’s an appearance of your brand! As search evolves, natural language search will still happen in browsers, on screens. Super long, natural language-type keyphrases are entered into Google all the time. There will be winners and losers, as always. These tips should help you win. It should be obvious, but it’s not. A lot of SEOs don’t really work to improve their writing skills. But this is the foundation of everything. What are people searching for? Content. What ranks? Content. Why does the visitor stay on the page? Content. If you aren’t confident in your writing skills, focus on this. You’re eventual goal is to make the best page on the Internet for your topic. If you’re not doing that, you’re really not doing SEO. There are all kinds of research involved in SEO. They are all important. Researching keywords: What is this audience searching for? Researching influencers: Who in this niche is creating content for relevant websites? To rank, you need authority. To get authority, you need links. To get links, you need visibility among content creators. To be visible to these people, you need to do outreach. This is a big part of the job. Good SEOs are friendly online networkers, who know how to use social media, who know how to connect with people online. – A useful infographic is more likely to get picked up by other bloggers, which is good for authority. – Helpful screenshots can make a post more useful, and more likely to get referenced by other sites. – A compelling featured image increases visibility in social media, making it more likely to be seen by content creators. It’s called “optimization” because it’s ongoing. This isn’t a one-time action. It’s a series of actions. And they are all based on data. Without Analytics, you’ll have no idea what’s working, what’s failing, and what’s almost working. Sometimes, a piece of content just needs a little nudge. But without data, you don’t know where to push. Don’t have these skills? Don’t worry. You’re going to have a very long, successful career and there’s plenty of time to learn them all. Start sooner and study harder if you want to ramp up fast. Work harder than the guy next to you. Study like it’s finals week. 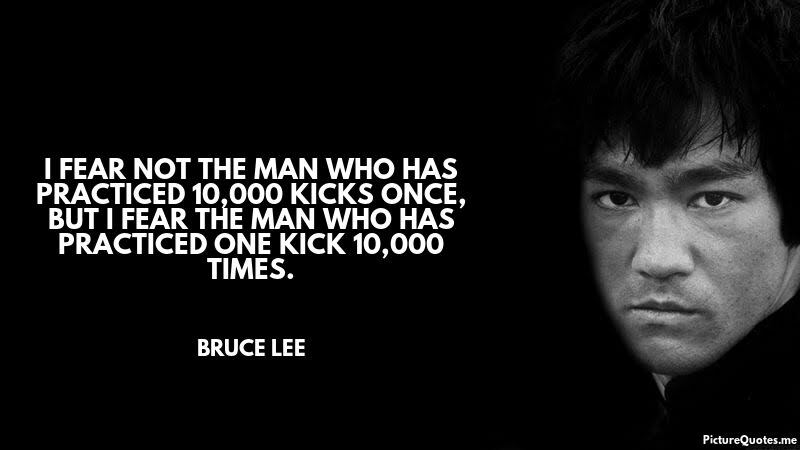 And never, never give up! SEO is constantly evolving, so our approach to it needs to constantly evolve too. 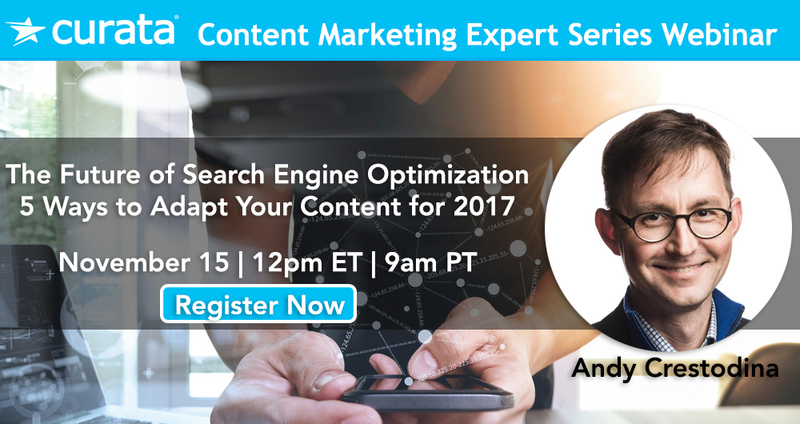 To find out more about the future of SEO, sign up for Curata’s Content Marketing Expert Series Webinar with me on The Future of SEO below. Andy Crestodina is the Strategic Director of Orbit Media, a web design company in Chicago. He’s also the author of Content Chemistry, An Illustrated Guide to Content Marketing. You are welcome to connect with Andy on Google+ and Twitter. Excellent researched post with lots of information. I also think that people will be more focus on social media in upcoming year. But I am surprised to see the traffic trend of email marketing. I am personally don’t like email marketing as a traffic source. Do you really think that email marketing will really get this position as traffic source, Andy? Yes! I do. I have my personal preferences too, but I can’t let those cloud my view of the big picture or the research. Email is a critical channel because there is no intermediary. Most of our traffic sources (Twitter, Facebook, Google, LinkedIn) are companies. And since they aren’t really in business to help us, we need to diversify our traffic sources. You don’t own your FB likes or Google rankings. But you do own your email list. If you build it ethically, if you live up to your promise to subscribers, it can be a very powerful and reliable source of loyal visitors. I don’t expect email to become less important as time goes on. For now at least, it looks like the research agrees! Thanks, Andy, (and Curata), for sharing so much helpful, relevant information in so few words. I’m referring to your 5 Skills list at the bank. Your “Empathy is the greatest marketing marketing skill” is also golden. 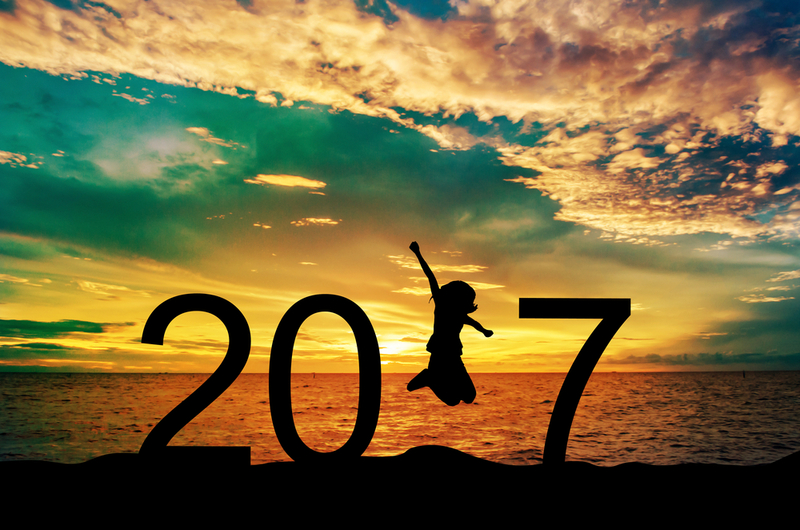 To the 2017 future, with confidence and 5 enhanced skills! Now a days content marketing have so much importance. Your blog post will be helpful for me. Thanks for sharing it here. If we talk about the success of online marketing so it is very difficult to achieve without having an effective content marketing strategy. And it is true that in the recent times content marketing has come out as the leading factor to increase and improve the online presence of any company. And it is the reason why the majority of companies are spending huge money on it nowadays. And as the popularity of content marketing is increasing day by day, so there are chances that we will come across lots of new trends in it in future. According to experts, the popularity of live streaming will grow a lot in 2017. YouTube Live, Facebook Live and Snap Chat, are already making it easy for companies to host product briefings, tutorials, and lots of other useful contents. So being a startup owner, get ready to leverage lots of expected future trends in content marketing and take your business to next high level. Since the field of content marketing has evolved a lot in the recent times so it has also opened up lots of opportunities for content writers. And if you talk about UK content writers so they have great diversity in their work. And with focusing on producing marketing content they also offer assignment writing services in the UK . Excellent, very informative article. thanks for sharing I must got helps from this article to create my blog contents. I appreciate your effort put the things together in this post. I was running a blog “http://www.hostingtipscoupons.com/” which is started in mid of this year. I’m not all happy with my blog. I still not understanding the reason why I was doing so. After reading the your content, I got some knowledge and wanted to apply on my Blog and I hope it will works for me. Great post thanks for sharing, it is very important to improve the security of online store. Hi Andy, al the things are well said in general but as far as we know almost every single keyword has it’s own set of factors that matter for better ranking. We did some internal studies about that, if anyone want to test it by himself – check surferseo. I am inspired by your instructional and informative article.Thanks for sharing. It is really supportive for future content marketing.